The Distinguished Minnesotan traditionally delivers Bemidji State’s Commencement address. The university’s 98th Commencement ceremony will be held May 5 at the Sanford Center in Bemidji. 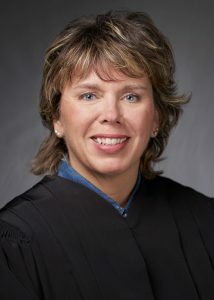 McKeig, a member of the White Earth nation, was appointed to the Minnesota Supreme Court by Gov. Mark Dayton on Sept. 1, 2016. Dayton called McKeig up from Minnesota’s 4th Judicial Branch, where she was appointed to serve by Gov. Tim Pawlenty in March 2008. Before her appointment by Gov. Pawlenty to the state bench, McKeig specialized in child protection and Indian welfare issues as an assistant county attorney in Hennepin County’s Child Protection Division, an Indian Child Welfare Act specialist and a part-time staff attorney for the American Prosecutors Research Institute. A 2016 Minneapolis Star-Tribune story describes McKeig’s appointment as “a career milestone” for an attorney who rose from poverty and other disadvantages in the tiny town of Federal Dam, near Leech Lake, to become the 94th associate justice on the state Supreme Court. In addition to her role on the Minnesota Supreme Court bench, McKeig is a trainer for the Minnesota Department of Human Services and an adjunct professor at Mitchell Hamline School of Law. McKeig earned her bachelor’s degree at the College of St. Catherine and her juris doctorate at Hamline University School of Law. She is a member of the American Indian Bar Association and a former member of the County Attorney’s Association. Bemidji State University’s Distinguished Minnesotan award was presented annually from 1981-2009, and was not awarded in 2010 or 2012. McKeig is the third Minnesota Supreme Court justice to receive BSU’s Distinguished Minnesotan award, joining Justice Rosalie Wahl (2002) and Chief Justice Kathleen Blatz (2006).